With DFW Best Roofing, Standing seam metal roofs help you re-imagine metal roofing with clean, sleek lines and a minimum of exposed fasteners for a unique aesthetic effect. A structural standing seam roof panel system meets performance goals by being constructed with a raised portion where the two panels meet, enhancing overall weather resistance. In addition, the panels interlock in such way that allows thermal movement without damage.Finally, standing seam metal roofs are a highly sustainable choice since it is manufactured using recycled content, as well as being fully recyclable. 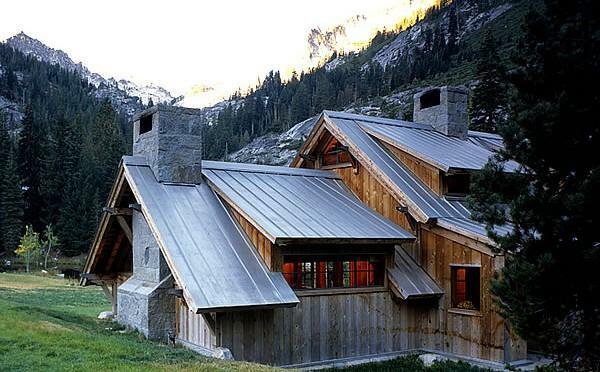 There's metal roofing, and then there's a particular type called standing seam metal roofing. Houses in your neighborhood with metal roofs most likely are of the standing seam variety. Continuous panels run from the ridge of the roof all the way down to the eaves. Between the panels are seams connected by fasteners which are raised above the level of the metal roofing. This is where we get the term standing seam, because the seam is raised or standing, as opposed to flush-mounted. Seam Fasteners: These seam fasteners might be anywhere from 0.5" to 1.5" high. Because these fasteners are concealed, you only see a smooth continuous ridge extending from top to bottom. Composition and Width of Panels: 12 to 19 inches wide, panels are usually made either of Galvalume-coated steel or aluminum. High Seams: One great advantage of standing seam metal roofs is contained in the name itself: seams, the weak point in any roof and a potential entry point for moisture, are raised above the level of the roofing panel. You can't say this for composition shingles. Fewer Seams: Because the metal panels run unhindered from the top to the bottom of the roof, not only are there no horizontal seams but in total the roof has a far fewer number of seams. Tough: Yes, metal is tough--very tough--but it's not impervious to all hazards. The sheet metal in this type of roofing can be penetrated by heavy falling limbs or dented by a severe hailstorm. "Cool Roof": All metal roofing in general is considered a "cool roof" by the US Environmental Protection Agency. This is because metal roofing can be painted any color, including colors on the lighter end of the spectrum which will prevent solar heat gain. 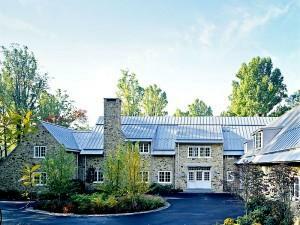 Sleek Looks: Standing seam roofs are perfect for certain types of contemporary or country-style houses. Due to the smooth, straight lines, these roofs give your house an "industrial" feeling, yet with a modern flair. These are not the rippled tin roofs that you might remember from warehouses of the past. Colors: I mentioned this earlier, but only in terms of lighter, sun-reflecting colors. But what about style? Metal comes in a decent array of colors: grays, browns, forest greens, earthy reds. Perhaps this isn't the full palette of colors as you might find at a paint store, but it's more than you'll find with composite/asphalt shingles. Fewer Roofers: Shake a tree and a hundred roofing contractors who install conventional roofs will fall out. But far fewer contractors install metal roofing, and fewer still install them well. This means that you will be searching longer for a good roofer and that total project cost may be higher because competition in the market is lessened. 100% true that snap-lock panel metal roofs are not advisable for roofs with a pitch of 2:12 or less (2 feet of vertical rise for every 12 feet of horizontal rise). However, with a better quality mechanically seamed panel it is no problem to go to a 1/2:12 pitch. You can even bump the seams up to 2" with a butyl seal for those applications. It's important to note, too, that when you get to these lower pitches, you're also below the recommended minimum pitch even for conventional shingles. Generally, these safely go down to a 4:12 pitch, with some shingle manufacturers warranting their product down to 2:12. Cost: Metal is considered a moderately-expensive roofing material (more expensive than conventional shingles, but less than high-end slate or copper). However, metal's higher cost can be amortized via its longer lifespan. Standing seam is a descriptive industry term for vertical sheet metal roofing system. Standing seam is one of the most popular metal roofing systems because of its beauty, durability, longevity, simplicity, versatility, and bold looks. Homeowners considering installing standing seam on their property, often do so because they like the modern style of raised seams giving their home that bold, contemporary look and feel, along with unmatched durability, longevity, and energy efficiency. 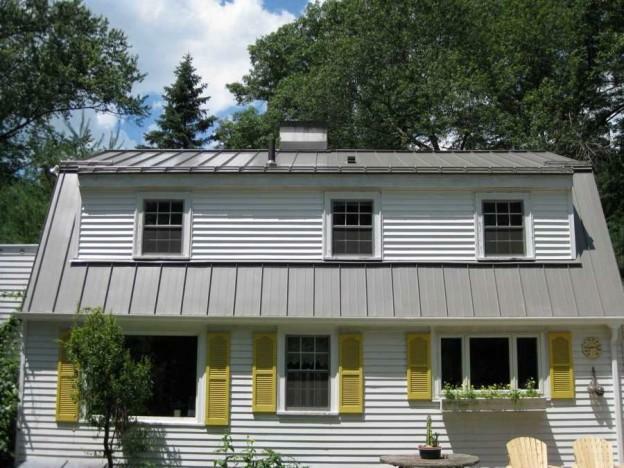 Standing seam is a high-end upgrade from a classic rib style that became synonymous with corrugated metal roofing. Unlike its predecessor, corrugated steel roofing, which is still being widely used today for many commercial, industrial, and even some residential projects, standing seam has an improved design featuring concealed fasteners. Raised seams, with no roof penetrations help minimize the chance of a roof leak down the road. Standing seam roofs are generally made from thicker grades of steel than corrugated steel roofs. While many corrugated steel roofs are made using a very thin 29 gauge steel, a minimum of 26 gauge galvalume steel is used for manufacturing of standing seam panels. A 24, and 22 gauge steel can also be used for residential and commercial styles including architectural (requiring a roof deck) and structural (only requiring a roof frame) profiles. A mid-panel stiffening technique is sometimes employed by the sheet metal fabricators, suppliers and manufacturers for a 16 inch and wider standing seam panels in order to prevent "oil canning" of the panels. A metal coil from which standing seam panels are manufactured is usually factory painted with a high-end Kynar 500 paint finish. – this is unlike corrugated metal roofs that are often painted with cheaper acrylic paints. Many architects are especially fond of specifying standing seam for new construction and existing roofs thanks to the beauty, durability, longevity, and relative softness with strength and flexibility of metal. Standing seam roofs can also help improve the overall energy efficiency of a house, as well as help prevent ice dams during the winter months. Standing seam panels can be manufactured from a coated steel, bare and painted aluminum, zinc, copper, and stainless steel. 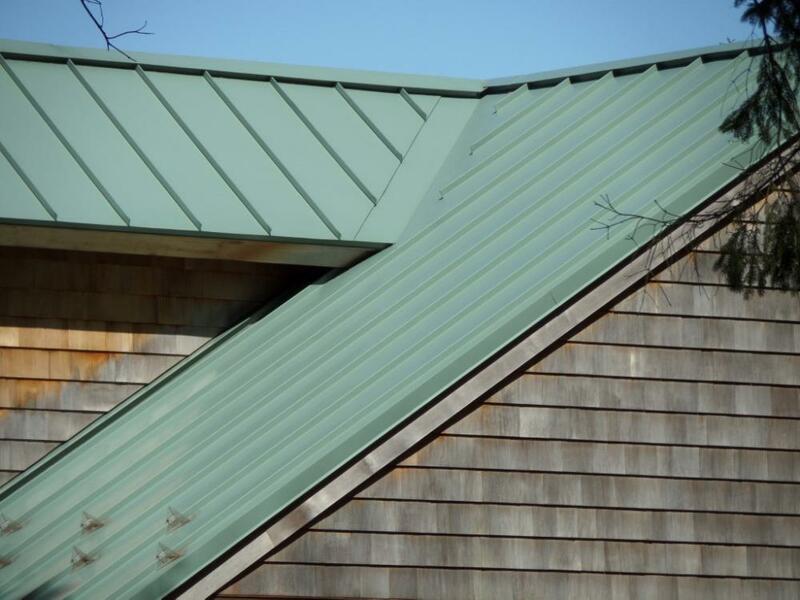 If you live near a coastal area, it is a good idea to opt for an aluminum standing seam roof in order to prevent any corrosion and rusting due to a relatively high concentration of salt in coastal and marine environments. A field-locked (mechanically locked) standing seam requires special crimping tools to crimp down/lock the seams during the installation. A snap lock standing seam system is a bit pricier, but the seams can be locked by a simple snapping of the panels together. 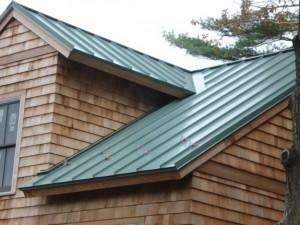 How Does a Standing Seam Compare to Metal Shingles? Standing seam metal roofs generally cost 25% to 35% more to install than metal shingles. This is largely attributed to a more tedious labor necessary to install a standing seam. In terms of performance, there is no significant difference between the two systems, however the quality of your installation and strict adherence to your system's manufacturer's specifications is by far the single most important factor determining longevity and performance of any residential or commercial, high-end metal roof. When most homeowners begin thinking about a metal roof, all they can envision are the roofs they have seen on barns and commercial buildings. Those types of metal roofs typically have panels that run vertically up the roof. These types of metal panel roofs are called "Standing Seam" because their prominent visual feature is the raised interlocking seam which joins one panel to the next. Often called "commercial roofing," or "agricultural panel roofing," or even "barn roofing," these products do provide the great protection and durability for which metal is known. Classic's ClickLock Standing Seam provides the look of the products that you see everywhere on restaurants and farm outbuildings. Some snaplacks has been engineered in narrow 12" panels for a clean, contemporary look that is architecturally scaled for the scale of any home rather than for the larger scale of a barn or shopping center. Manufactured from heavy-duty, rust-free aluminum, SnapLock stands apart from most standing seam panels that are steel. Additionally, in comparison to most agricultural panels, SnapLock has all concealed fasteners, eliminating failure-prone rubber washers beneath exposed screw heads. For homeowners who want a metal roof with a traditional appearance, ClickLock is designed to be the best. The stainless fastening clips and screws ensure secure and lasting attachment with no chance for problems resulting from expansion and contraction. The trims used to complete a ClickLock roof have also been carefully designed for beauty and durability. One thing to consider when looking for a standing seam roof is how it will be produced. Portable roll-formers make standing seam roofing easy to produce and many contractors use these field-formed systems. Unfortunately, easy does not mean better as the quality and exactness of the machinery can be compromised when moved from site to site. Additionally, unknowing contractors can use low-quality, cheap metal never intended for residential applications. Snaplocks, on the other hand, is produced with precise tolerances under controlled conditions in our main 120,000 square foot factory in Ohio. Using only the best first-run aluminum and quality Kynar 500 or Hylar 5000 coatings, it is Certified 'Premium' under the Metal Construction Association Certified Roofing Panels program. SnapLock is truly top-of-the-line standing seam roofing for your home. Homeowners Associations and Architectural Review Boards love our shingle, slate, and shake products. They want to allow their residents to enjoy the added property value that a metal roof provides, but they don't want to diminish the aesthetics of their communities with roof styles more commonly seen in agricultural and commercial applications. 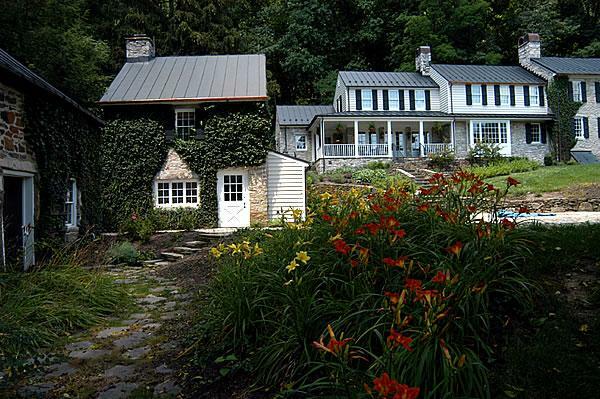 Whether you want a traditional metal roof look (which can work great especially in a rural setting!) 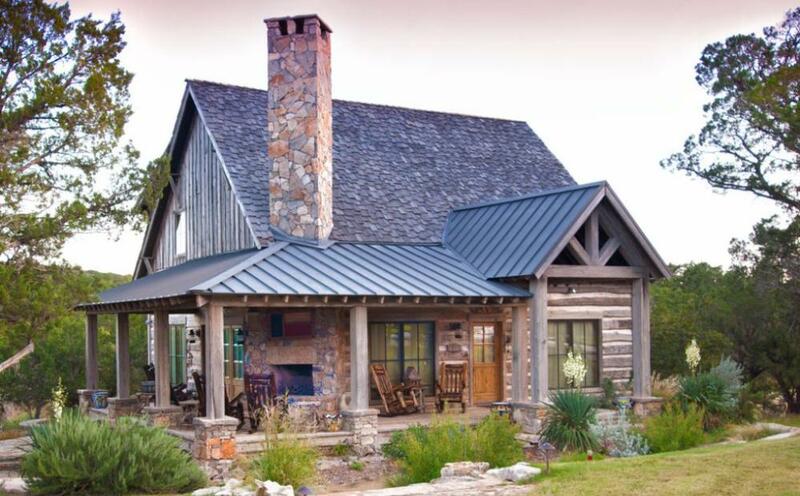 or a look that fits well with the other homes in your neighborhood, Classic Metal Roofing Systems has you covered with the best that's available in today's metal roofing industry.